On Tuesday, I was in meetings from 8:30 a.m. until 3:30 p.m. They were good, productive meetings with smart, fun, effective co-workers. Last week, I had two days of 11 hours (or more) of meetings, and a total of 33 hours of meetings scheduled on the week, amongst my highest ever. 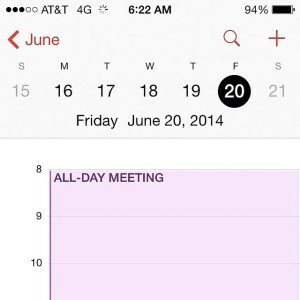 Before my current role, I didn’t have this many meetings. So I must have learned some coping strategies along the way, right? I’ve been thinking about how I might help others who have to go through that same learning process. All day meetings are the marathon of professional life. 2. Figure out who is running it. 3. Find out if there will be coffee. Even if you don’t drink coffee, your experience will be much better if coffee is provided, for your java-swilling coworkers. 4. Find out if the coffee will be good. The only thing worse than no coffee is bad coffee. 5. Find out if there will be healthy snacks. You need to do something to keep your energy up. And if it’s healthy, you can nosh your way through the hours. I find crunchy stuff helps keep my brain firing. NOTE: by asking these questions numbers 3, 4, and 5, you greatly increase the likelihood of there being good coffee and healthy snacks. See what I did there? If you eat a large lunch and try to keep going in the afternoon, you’re going to have trouble. Tony Memmel (a one-armed singer/songwriter) sings, “Just order a salad and get on with the next big thing.” Wise words that I struggle to heed, since I am a glutton. 7. Fight for your right…to stand up. Usually in such situations, at least with creative teams, it’s a given that you can get out of your chair as much as you want. This gives you a new perspective on the room and on the dynamics of the discussion. Stretching, too, helps me feel like a human. Nowadays, we need to think about how to feel (and even actually be) human. Go for a walk. Blitz your email. Make a quick call. Have an important conversation with someone else who is on break. 9. Have a job that you love. If you can swing this one, at the end of the day, everything will be worth it. Even all-day meetings. What did I miss? How do you cope with all-day meetings? Leave a comment. Adam, great to discover your blog! Introvert strategy is to scope out the breaks and disappear with a good book, or take a nap!